Why are we here? 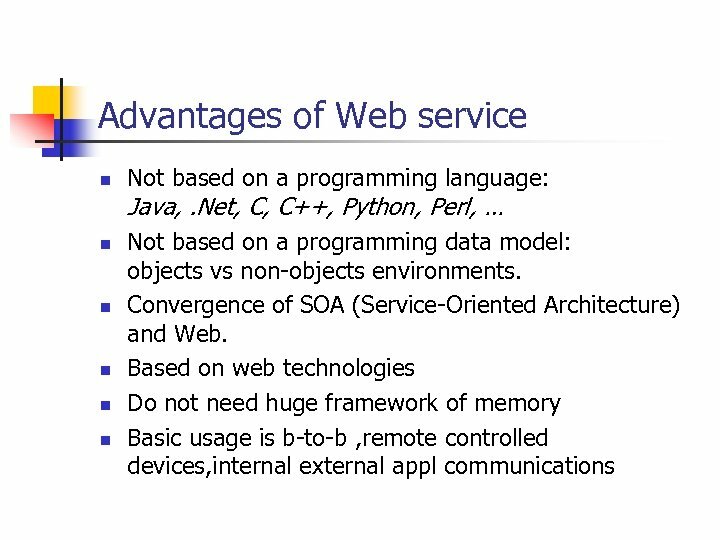 n "Web Services" contain the word "Web" and Web technologies matter. 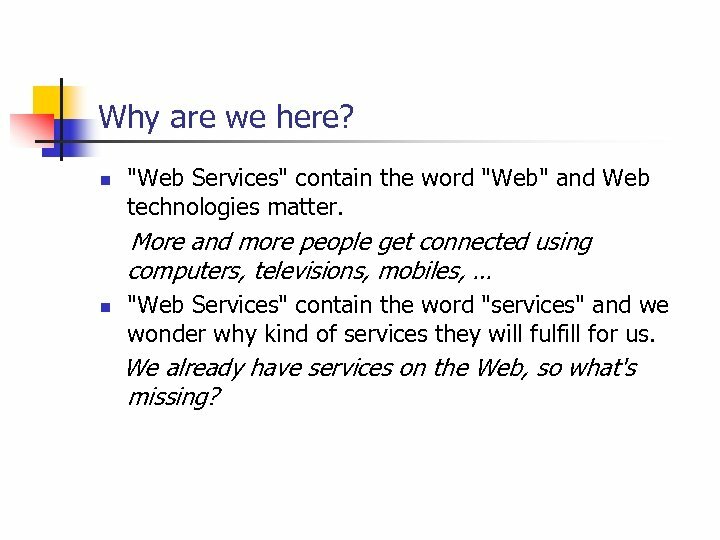 More and more people get connected using computers, televisions, mobiles, … n "Web Services" contain the word "services" and we wonder why kind of services they will fulfill for us. 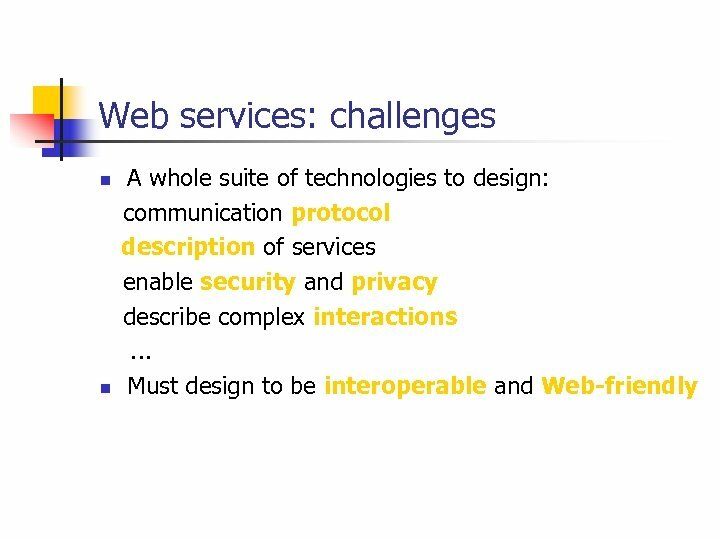 We already have services on the Web, so what's missing? 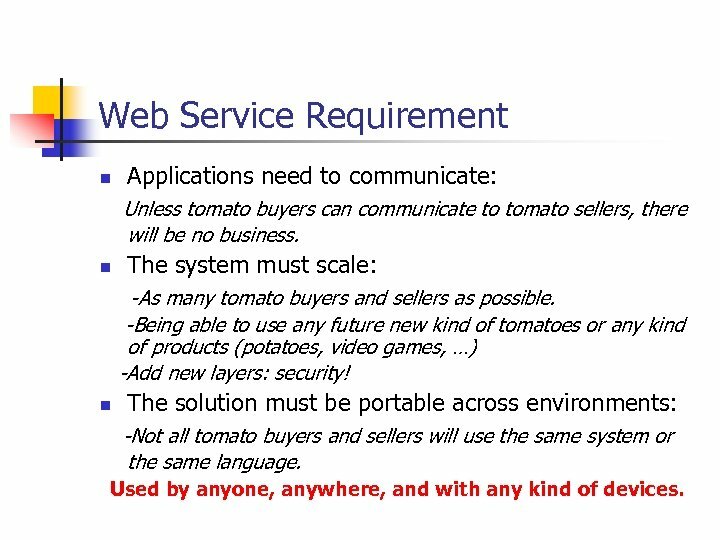 Web Service Requirement n Applications need to communicate: Unless tomato buyers can communicate to tomato sellers, there will be no business. n The system must scale: -As many tomato buyers and sellers as possible. -Being able to use any future new kind of tomatoes or any kind of products (potatoes, video games, …) -Add new layers: security! 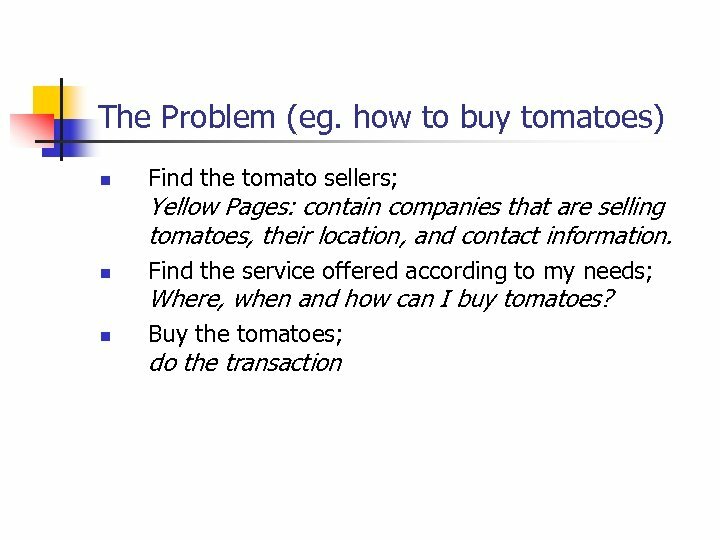 n The solution must be portable across environments: -Not all tomato buyers and sellers will use the same system or the same language. Used by anyone, anywhere, and with any kind of devices. 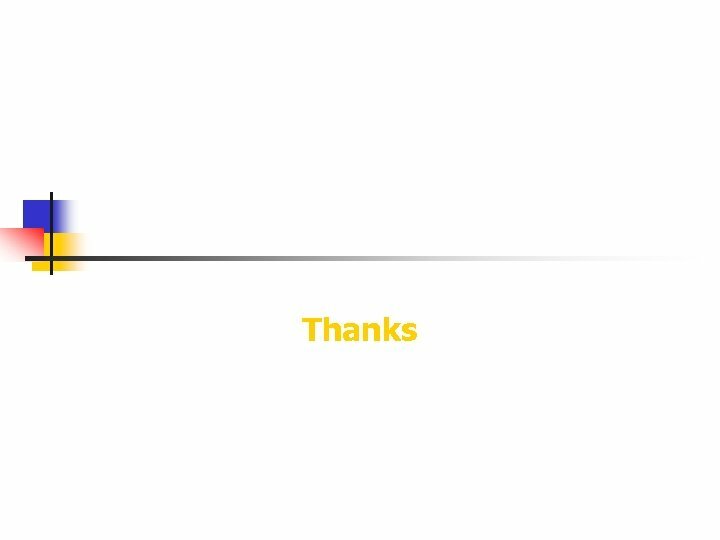 Existing solutions n n How can two (or more) applications communicate today? Ad Hoc solutions: Unless you want to buy your own tomatoes, it won't be useful. 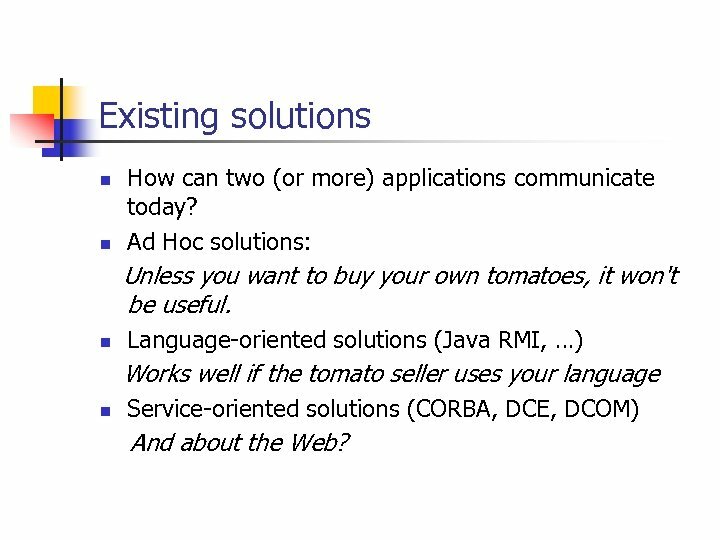 n Language-oriented solutions (Java RMI, …) Works well if the tomato seller uses your language n Service-oriented solutions (CORBA, DCE, DCOM) And about the Web? 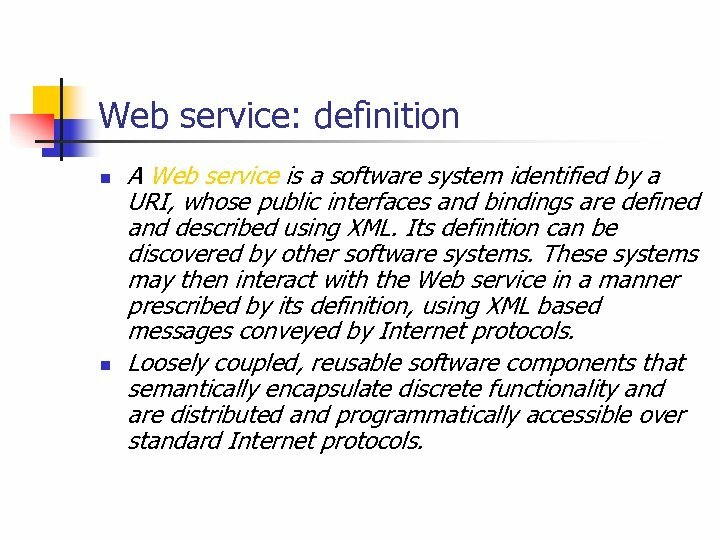 Web service: definition n n A Web service is a software system identified by a URI, whose public interfaces and bindings are defined and described using XML. Its definition can be discovered by other software systems. 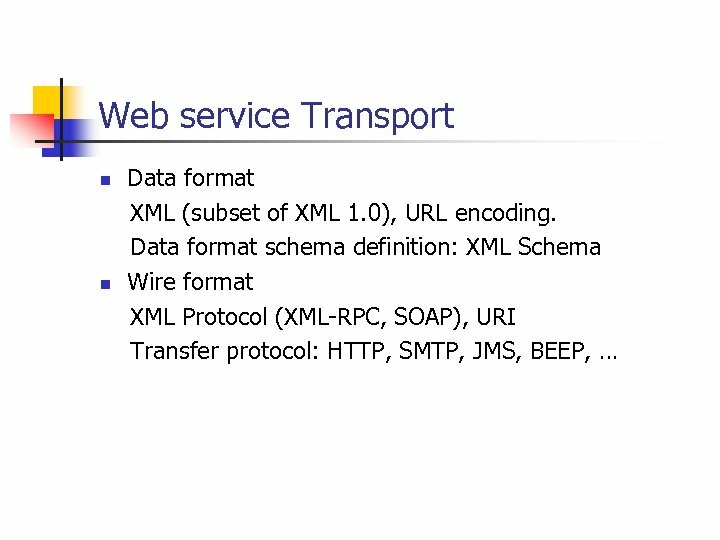 These systems may then interact with the Web service in a manner prescribed by its definition, using XML based messages conveyed by Internet protocols. 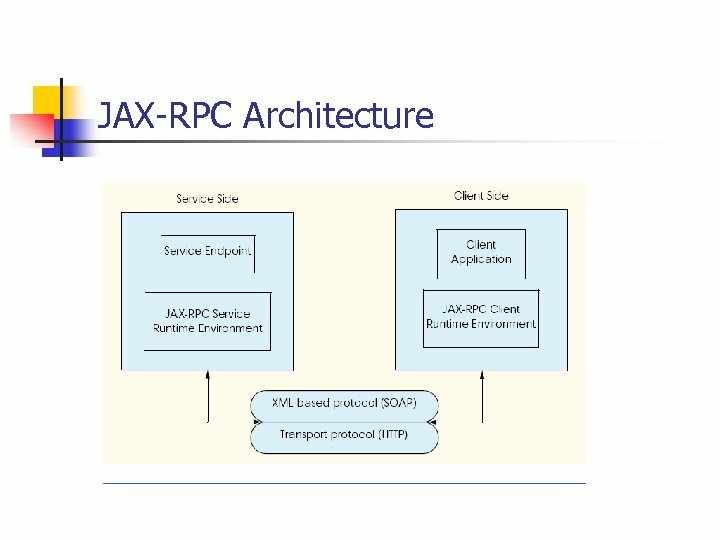 Loosely coupled, reusable software components that semantically encapsulate discrete functionality and are distributed and programmatically accessible over standard Internet protocols. 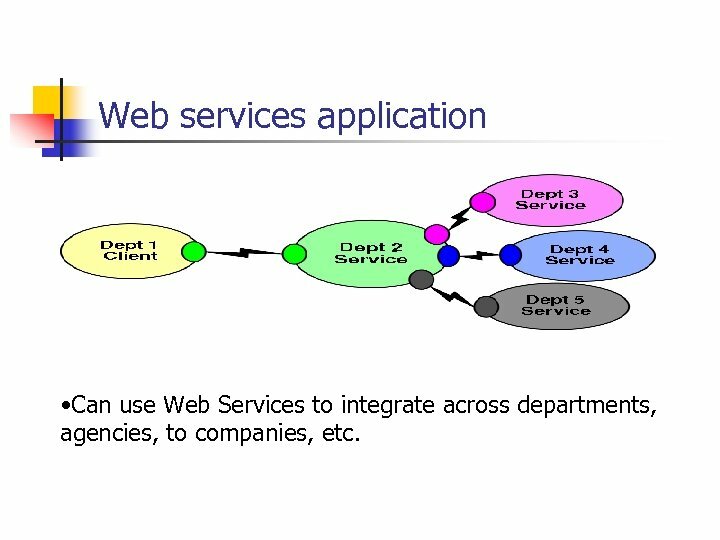 Web services application • Can use Web Services to integrate across departments, agencies, to companies, etc. 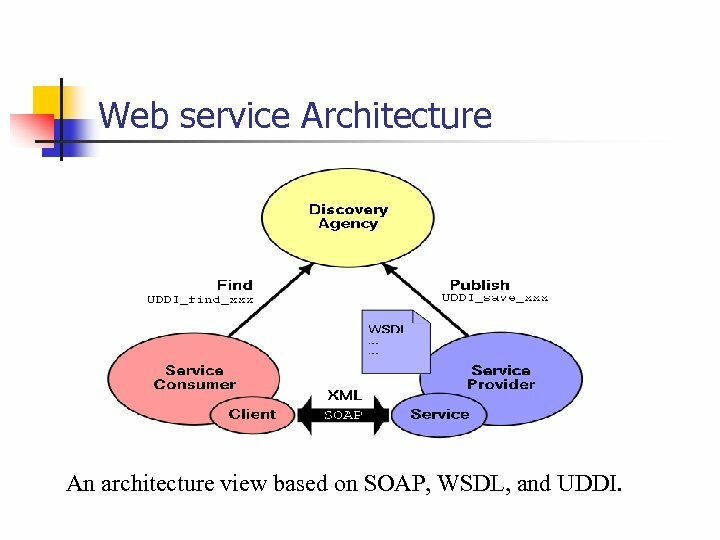 Web service Architecture An architecture view based on SOAP, WSDL, and UDDI. 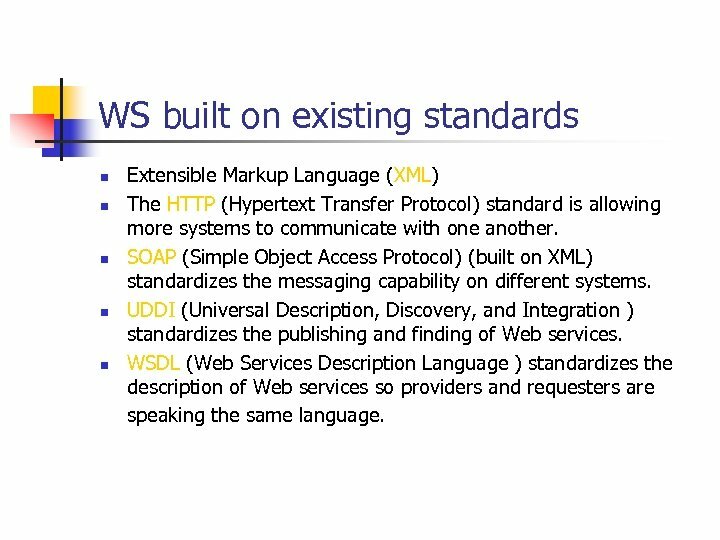 WS built on existing standards n n n Extensible Markup Language (XML) The HTTP (Hypertext Transfer Protocol) standard is allowing more systems to communicate with one another. 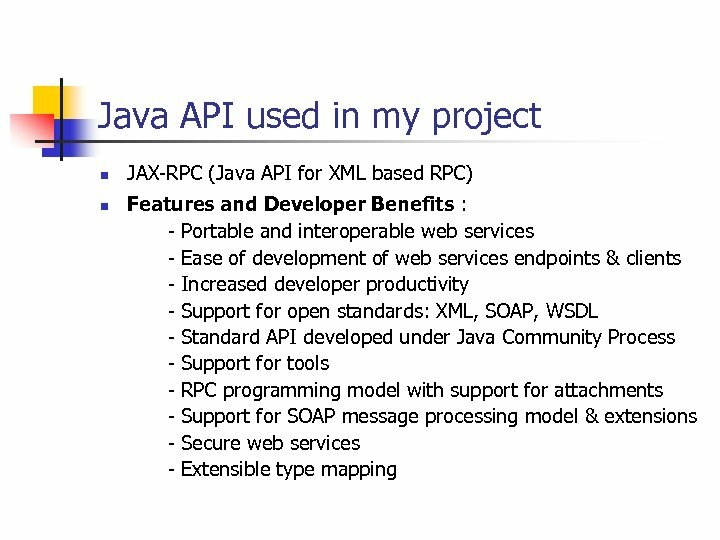 SOAP (Simple Object Access Protocol) (built on XML) standardizes the messaging capability on different systems. UDDI (Universal Description, Discovery, and Integration ) standardizes the publishing and finding of Web services. 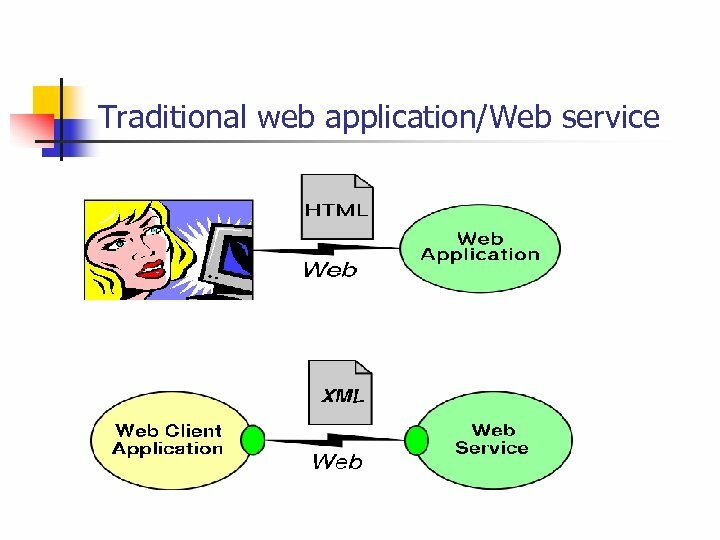 WSDL (Web Services Description Language ) standardizes the description of Web services so providers and requesters are speaking the same language. 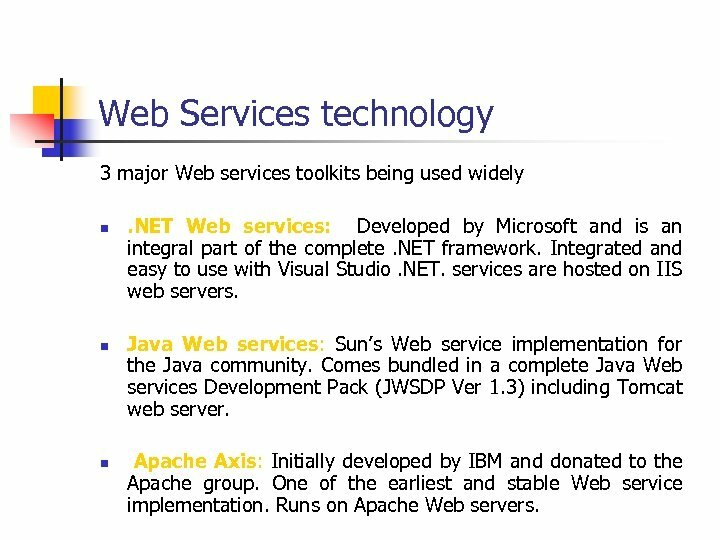 Web Services technology 3 major Web services toolkits being used widely n n n . NET Web services: Developed by Microsoft and is an integral part of the complete. NET framework. Integrated and easy to use with Visual Studio. NET. 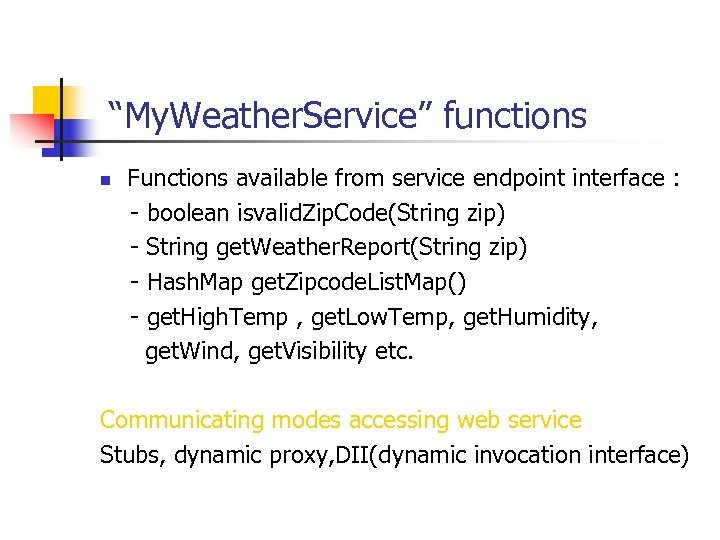 services are hosted on IIS web servers. 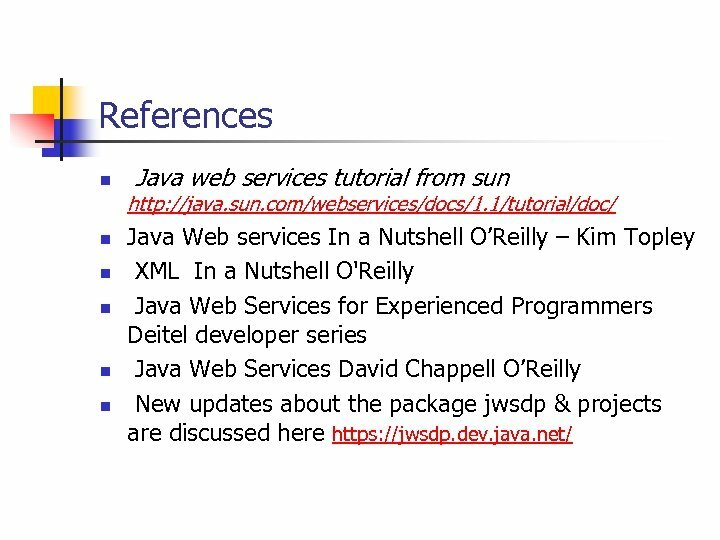 Java Web services: Sun’s Web service implementation for the Java community. 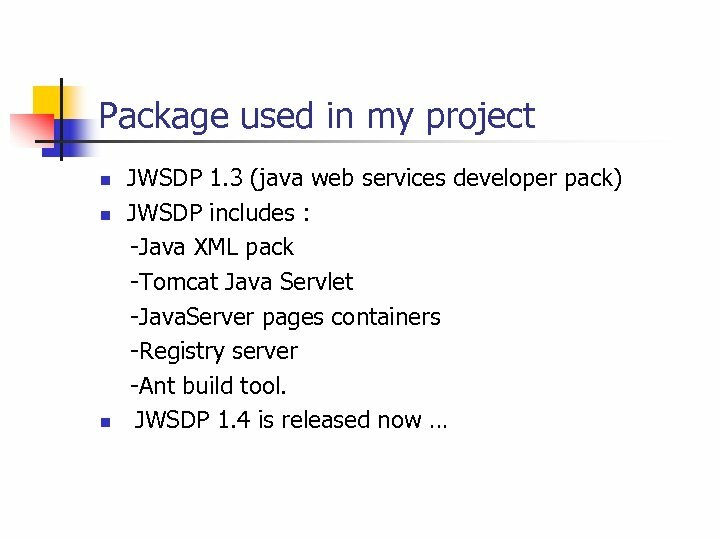 Comes bundled in a complete Java Web services Development Pack (JWSDP Ver 1. 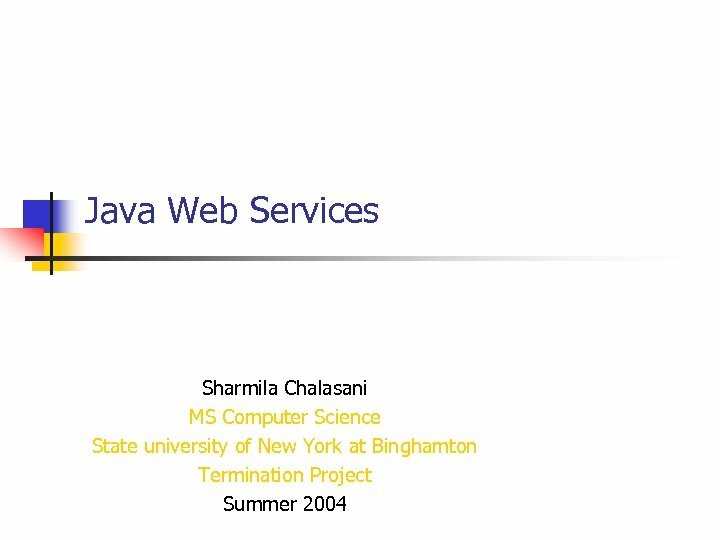 3) including Tomcat web server. Apache Axis: Initially developed by IBM and donated to the Apache group. 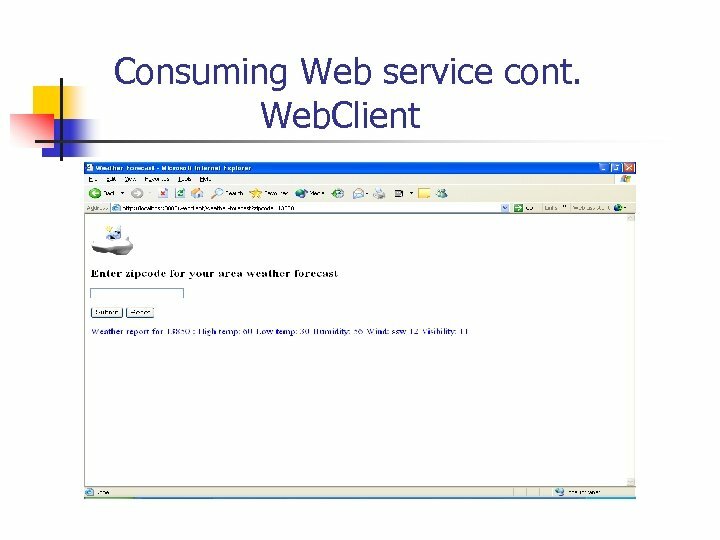 One of the earliest and stable Web service implementation. Runs on Apache Web servers. 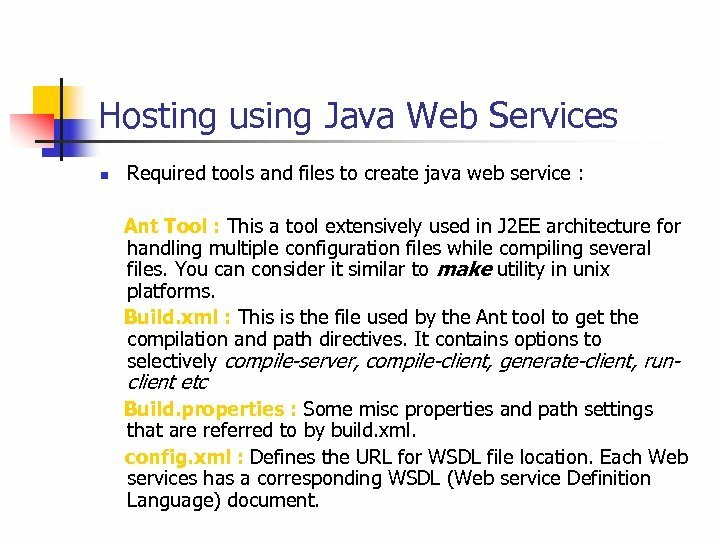 Hosting using Java Web Services n Required tools and files to create java web service : Ant Tool : This a tool extensively used in J 2 EE architecture for handling multiple configuration files while compiling several files. You can consider it similar to make utility in unix platforms. Build. xml : This is the file used by the Ant tool to get the compilation and path directives. It contains options to selectively compile-server, compile-client, generate-client, run- client etc Build. properties : Some misc properties and path settings that are referred to by build. xml. config. 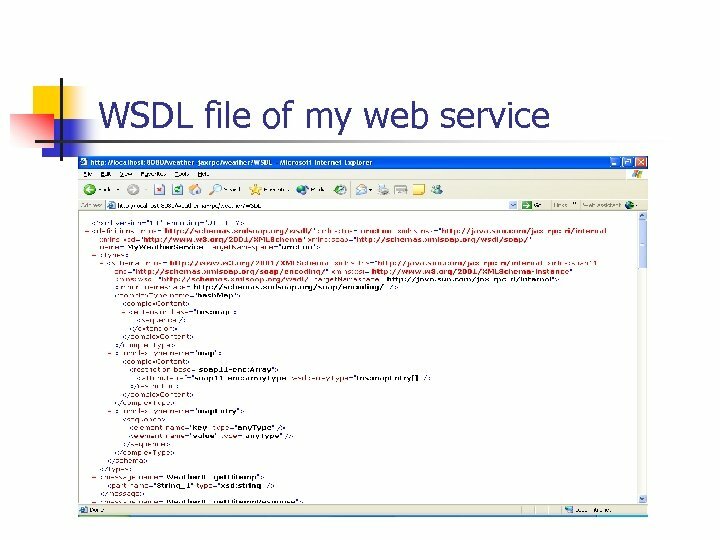 xml : Defines the URL for WSDL file location. 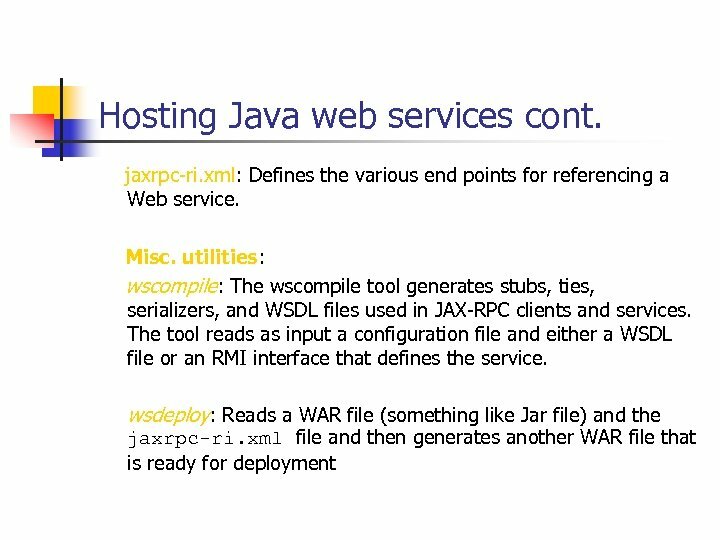 Each Web services has a corresponding WSDL (Web service Definition Language) document. Deployed “My. Weather. 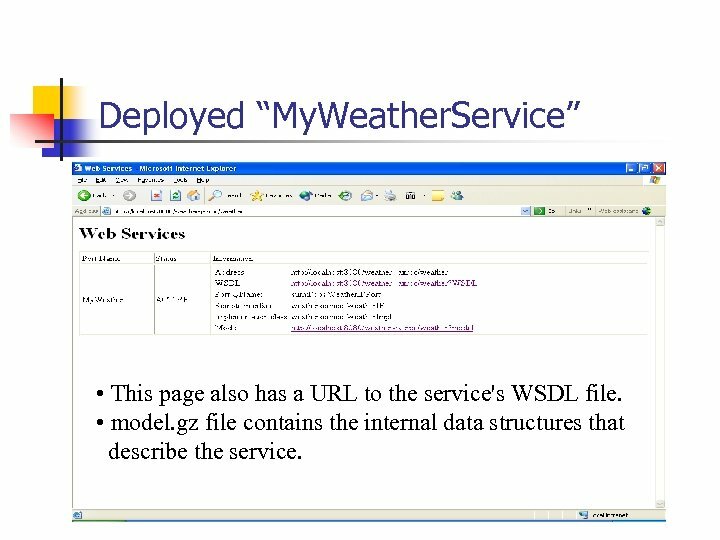 Service” • This page also has a URL to the service's WSDL file. • model. gz file contains the internal data structures that describe the service. Consuming “My. Weather. 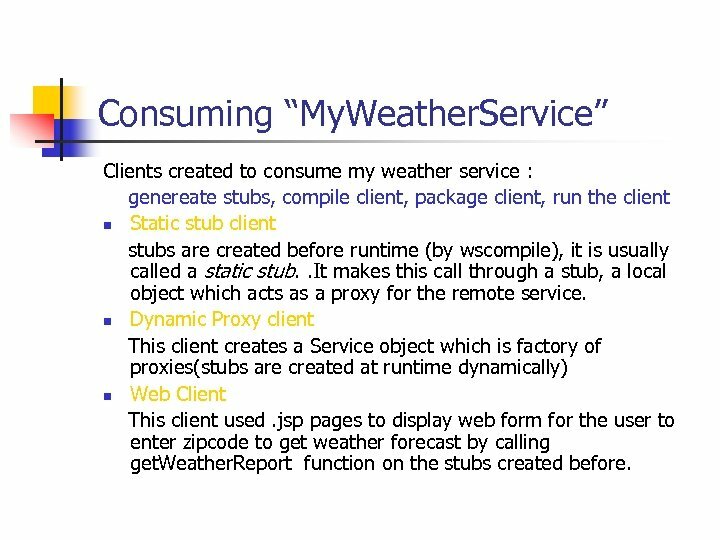 Service” Clients created to consume my weather service : genereate stubs, compile client, package client, run the client n Static stub client stubs are created before runtime (by wscompile), it is usually called a static stub. . It makes this call through a stub, a local object which acts as a proxy for the remote service. n Dynamic Proxy client This client creates a Service object which is factory of proxies(stubs are created at runtime dynamically) n Web Client This client used. 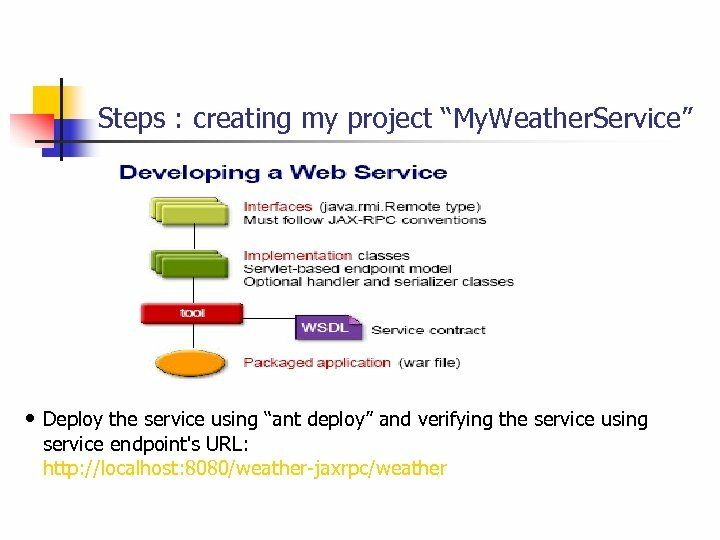 jsp pages to display web form for the user to enter zipcode to get weather forecast by calling get. Weather. Report function on the stubs created before. Some facts n n n Web service is a new paradigm, it is in initial stages. 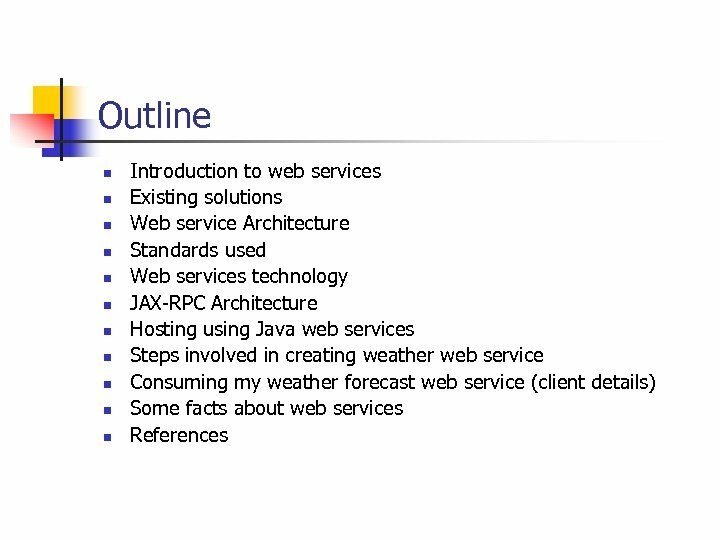 Web service tech is evolving rapidly, sometimes in unexpected directions. such changes may cause difficulties early on. Various standards and specifications are still being defined and refined. Security standards are also being defined. 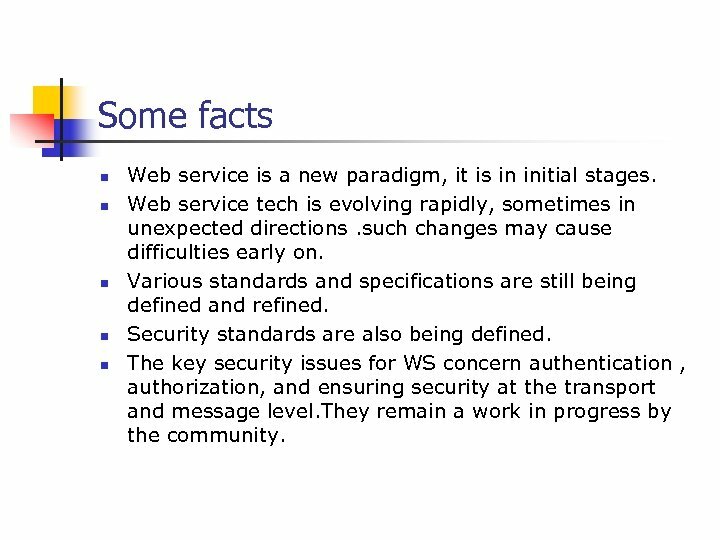 The key security issues for WS concern authentication , authorization, and ensuring security at the transport and message level. They remain a work in progress by the community.